This 3 day & 2 night Iquitos Peru rainforest tour is geared for people who are really interested in seeing culture along with wildlife but also want the comfort of a jungle lodge in Iquitos. This expedition is full of our most popular activities including: visit to monkey island, anaconda holding, dolphin spotting, rain forest hiking, piranha fishing, night caiman excursion, birding excursions, canoe rides, and visits with native Amazonian tribes. 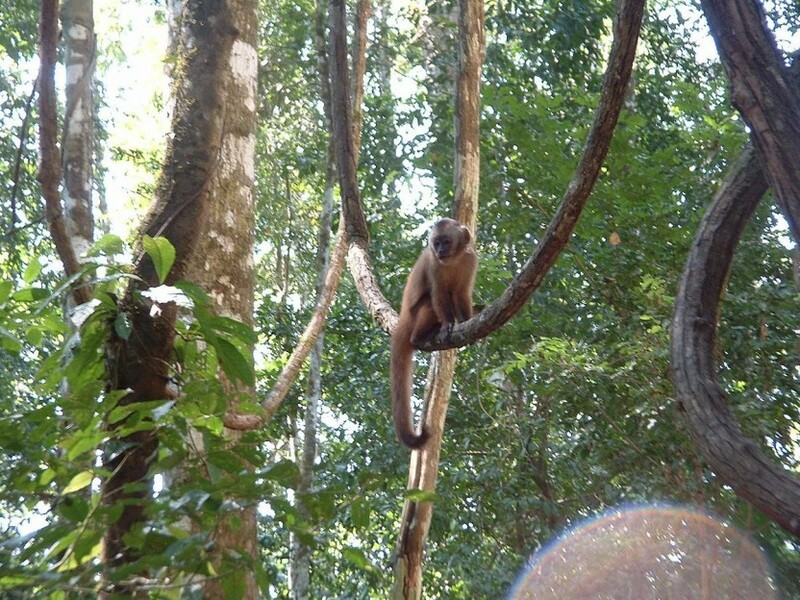 This 6 Day & 5 Night rainforest tour is one of our most popular Iquitos jungle tours! Our rainforest guides will take the traveler deep into the jungle where we will have the opportunity to experience the sights and sounds of the Amazon rainforest. This tour includes 1 night of rainforest camping at Mirador Palo Alto, a 3 story observation tower that provides a birdseye view of the lowland rainforest. This Iquitos Peru jungle tour also includes some of our most popular activities including: night time caiman excursion, visits to lagoons, bird watching excursion, piranha fishing, rainforest hiking, visit with native Amazonian tribes, canoe rides, viewing of pink river dolphins and much more! This 2 day Iquitos jungle tour is perfect for anyone traveling to Iquitos Peru on a tight schedule. Maybe you just want to get a taste of the Jungle and dont have a lot of time? This expedition is packed with a variety of our most popular activities including: visit to Monkey Island, anaconda holding, freshwater dolphin spotting, canoe rides, night time caiman excursion, visit to Belen! A great option for anybody who doesnt have much time but is looking for an authentic Iquitos jungle tour. During this 4 Day & 3 Night Iquitos, Peru rainforest tour our Iquitos jungle guides will take the traveler deep into the largest, most diverse natural areas in the world. This tour includes 1 night of camping in the jungle at Mirador Palo Alto, a 3 story observation tower that provides a birdseye view of the lowland jungle. This rainforest expedition also includes some of our most popular activities including: night time caiman excursion, bird watching excursion, piranha fishing, rainforest hiking, visit with native Amazonian tribes, canoe rides, viewing of pink river dolphins and much more! During this 5 Day & 4 Night rainforest tour from Iquitos our Iquitos rainforest guides will take the traveler on a wild adventure into the Amazon jungle. This tour includes 1 night of rainforest camping at Mirador Palo Alto, a 3 story observation tower that provides a birdseye view of the lowland jungle. This Iquitos Peru jungle tour also includes some of our most popular activities including: night time caiman excursion, bird watching excursion, piranha fishing, rainforest hiking, visit with native Amazonian tribes, canoe rides, viewing of pink river dolphins and much more! This 10 Day & 9 Night peru rainforest camping tour into the Pacaya Samiria Reserve will take travelers very deep into the largest, most diverse natural areas in the world. This tour is only for the most adventurous of travelers looking to really expose themselves to the sights and sounds of the Amazon Rainforest. We will enter the reserve where the Amazon river is born and traveling up the Maraor river we will have the opportunity to see a very private, untouched part of the Amazon Rainforest. This Pacaya Samiria tour includes some of our most popular activities including: freshwater dolphin spotting, night time caiman excursion, rainforest camping, animal observation excursions, rainforest trekking, visit with native Amazonian tribes, canoe rides, fishing excursions, nocturnal rainforest hikes and more!